Get ready for an ancient adventure in Medieval Times. With reels filled with shields, dragons and princesses, Quest for the Grails offers FREE spins, multiplied wins and a journey of a lifetime! Spin to win today! Join the adventure and start a Quest for the Grails. 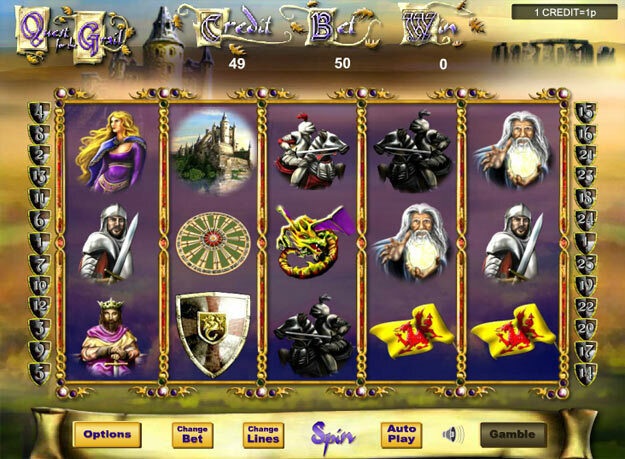 This fun video slot game gives you the chance to be master of the reels and hopefully spin your way to a jackpot. Enjoy the classic adventure theme as you spin Quest for the Grails reels and with 25 pay lines you have many chances to win. This slot also gives you the chance to win up to 25 free spins and there's the chance to win up to 100x your triggering bet too if you scoop the jackpot prize.